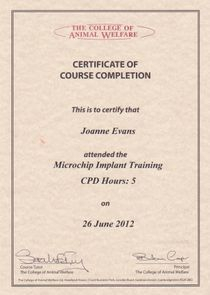 We offer Microchipping for your Dog, Cat, Rabbit or Ferret within the comfort of their own home making it much less stressful for both you and your pet. The details of your Pet are stored on the UK's largest Lost & Found Database for Microchipped Pet's which is managed by The Kennel Club. You will also receive 4 weeks free Pet Insurance! 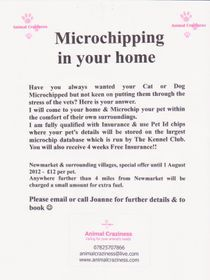 Newmarket & surrounding villages are £10 per animal. Anywhere beyond the radius, there will be a small fuel charge. 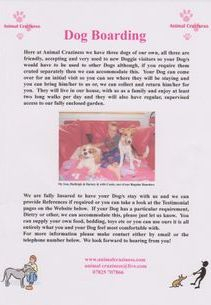 We also offer this service at our Fun Dog Shows & Pet's Corner. 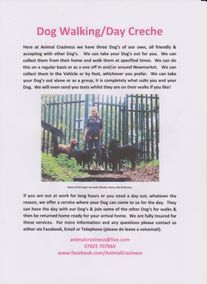 Here at Animal Craziness we have three dogs of our own, all three are friendly, accepting and very used to new Doggie visitors so your Dog/s would have to be used to other Dogs although, if you require them crated separately then we can accommodate this. Your Dog can come over for an initial visit so you can see where they will be staying and you can bring him/her to us or, we can collect and return him/her for you. They will live in our house, with us as a family and enjoy at least two long walks per day and they will also have regular, supervised access to our fully enclosed garden. We are fully Insured to have your Dog/s stay with us and we can provide References if required or you can take a look at the Testimonial pages on the Website below. If your Dog has a particular requirement, Dietry or other, we can accommodate this, please just let us know. You can supply your own food, bedding, toys etc or you can use ours it is all entirely what you and your Dog feel most comfortable with. Please contact us for more information. Keeping pet's is so much fun in every way apart from the mundane job of having to clean out your pet's cage/home when you have everything else to do. 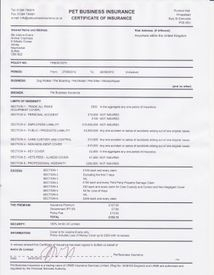 We offer a service which will do this for you. 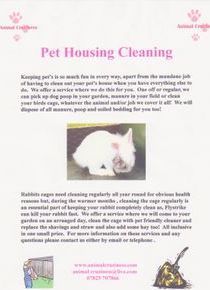 From picking up dog poop in your garden, horse manure in your field or cleaning your Rabbit hutch out. We offer all of this and with the small pets such as Rabbits,Guinea Pigs & Hamsters, we can supply the shavings, hay and straw and all manure and poop can be disposed of by ourselves, all inclusive! It is hard to find someone trustworthy and caring to look after your beloved pet. I can offer a completely caring service to your pet to make sure your time apart is as relaxed as possible. This service is offered either in my home or within your own home, whichever you prefer. I also have two pens in the garden which can be used during the summer for both Cats & Dogs so, if you have a Cat & Dog who live together they can stay together. I can take Dogs, Cats, Rabbits, Birds, hamsters, gerbils, rats and mice, as long as they come in a secure cage, although we do have a few of our own for boarders. We always meet your pet first and spend time with them before your time apart. I can feed your pet for you in your own home. Perhaps you are going to be out all day at work or your going away for a few days, one off or often it is not a problem. From Goldfish to Dogs we will feed them all. I can take care of and/or walk your dogs for you either on a long term basis or now and again. We have three of our own dogs which are totally Dog Friendly and very experienced with newcomers so, your dog can either come to our home whilst you are away and experience a 'home from home' environment with lots of stimulating attention and toys to play with or we can also walk your dog for you if this is what you require, again on a permanent basis or one off. 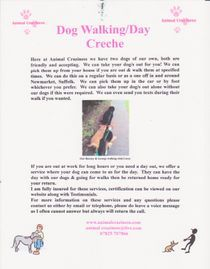 We offer hourly dog walks which start from the moment we arrive at your house. We can also visit your home if you have a new puppy to assist with toilet training whilst you are not there to do so. If you need to take your pet to the vets either routinely or emergency we can take you. We offer a service where we can either take your pet for you, take you and your pet and then pick you back up or we can take you both and stay with you to offer support if you wish. We can also take you and your pet somewhere if needed for example, over to a friends house, to a dog show or maybe to a special walk, whatever the journey we can take you. Sometimes we find ourselves in a situation where we need some help with caring for our pet. For example, if you are moving home and it is going take some time, we can care for your pet here for you until you are ready for them. 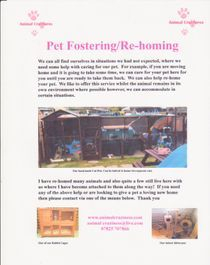 We can also help you re-home your pet should the need arise. I have re-homed many animals such as cats who came to me as their owner had passed and they became homeless. Whatever your pet and situation do give us a shout as I am sure we can help you out. I know all to well how distraught you feel when you lose any animal you have become attached to. I have lost three cats on the road and one dog to liver failure. I have also lost other small pets but every single loss has hurt me badly. Here at Animal Craziness you can email me and tell me how you are feeling after the loss of your pet and I will be more than happy to chat with you. You might want to just tell me about what your pet was like or you might want to ask me about getting another one after your loss. You can send me photos and stories about your time with your friend. Whatever the question just ask me as I know I can do my best to offer support and hopefully make you feel better. I am not qualified in Bereavment but I have a huge heart and sometimes just sharing something can help. 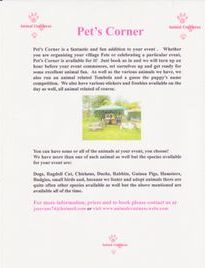 Pet’s Corner is a fantastic and fun addition to your event. Whether you are organising your village Fete, you want to educate your children or celebrating a particular event, Pet’s Corner is available for it! Just book us in and we will turn up an hour before your event commences, set ourselves up and get ready for some excellent animal fun. As well as various animals to pet we will also run an animal related Tombola and a guess the puppy’s name competition. Microchipping is available and we also have various stickers and freebies available on the day as well, all animals related of course. All my animals are used to a noisy, stimulating environment so they enjoy this extra attention too! 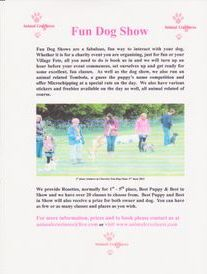 We can organise and run a fun dog show for your fete or event. All you will need to provide is a taped off large enough area and we will do the rest! We normally organise 10 various classes with Rosettes up to 5th place in all classes and a Best in Show. We can also offer an animal related Tombola to run alongside the show as well if you wish and also Microchipping. If you require a smaller amount of classes just ask we can accommodate. A fantastic fun afternoon for all! If you have a question you need to ask then go ahead! It could be your rabbit has a really messy bottom, your dog keeps leaping the gate every time you leave, your hens egg shells are soft, how often do we flea and worm our pets or even what are the best toys for Guinea Pigs, no matter what the question we will find you the answer. Just send us a quick email or you can catch us on Twitter or Facebook. Ill be sharing some stories and photos of my animals with you over the coming months on our Facebook page and I would like you to do the same. you can post your photo with a little caption either straight to the page using the link above or you can email and we will choose some to feature on our website so keep your eyes out for them to appear on here! Nothing more pleasing than viewing your own pet online. Eventually we will be running competitions as well so watch out for that too!! I look forward to hearing you and helping you out with your beloved Pet in any way I can.